My Mother and I recently signed up for the Millinery course at Stratford Off The Wall, the place where I took my Faux Food class this past September. Over the course of the week, we will learn how to make either fascinators or buckram or soft-form hats. As the two of us do all the costuming for Bygone, I thought I should look up some authentic period pieces for inspiration, in hopes I can make something for a future show. There are so many styles of hats that were seen during the first half of the 20th century, that I decided to put together a very simple, very brief history for any other costumers out there who need a quick reference guide. Hope it helps! 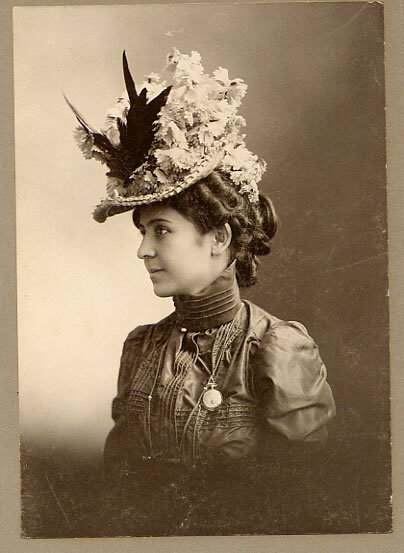 In the early Edwardian period, hats were a fashion accessory, rather than a necessity. Most were kept fairly small, sitting on the top of the head atop a pile of hair. More masculine styles had begun to emerge during the 1890s, and some of these were still popular during this period. 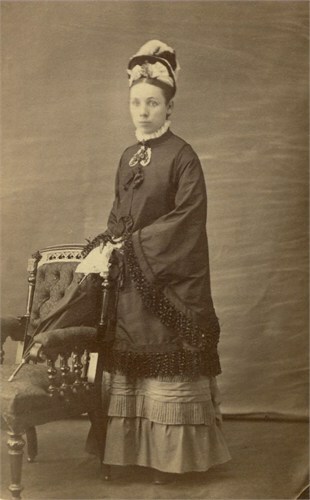 Women were seen wearing traditionally male styles such as the “Boater” or “Trilbys”. Bonnets had grown out of style, and women preferred hats that soared above the head, sometimes called “3 Story” or “Flower Pots”. During the 1910’s, hats began to grown again in size. The brims grew increasingly large, often reaching past the wearer’s shoulders. To keep these large pieces steady, hat pins, sometimes over a foot long, were used to secure them to the hair. Large plumes and floral pieces adorned hats of this period. During the First World War, however, hats began to decrease in size, fitting closer to the head and sitting low-down on the face, giving the woman a youthful appearance. Hats became more plain, as it was seen as unpatriotic to be concerned with ones appearance during this time. Continuing the trend of the previous decade, hats continued to get lower on the brow and closer fitting on the head. The “cloche hat”, a bell-shaped piece that covered the wearer’s head almost entirely, became a staple of the period. Rather than tall feathers or blooms adorning the hats, design was seen through elaborate detailing in shape, with felt molded into waves and curls. Most hats of the period, particularly later in the decade, did not have brims. The 30’s saw the re-appearance of brims as well as a shallower crown to accommodate the full, curled hairstyles that were popular in this decade. As parasols were now out of fashion, wider brims became popular to protect the wearer from the sun. Towards the end of the decade, hats became taller and were perched on the top of the head, similar to the way they were in the early years of the century. Women’s fedoras (traditionally a male style) also became fashionable when paired with a tailored suit. World War II shaped the look of 1940’s women’s fashion. Because of rations, clothing was often utilitarian looking and closely fit, using as little fabric as possible. Hat materials, however, were not rationed, and so the decade saw the emergence of a wide variety of hat styles, overly adorned and frequently elaborate. Feathers, veils, and artificial flowers graced the tops of wearer’s heads, and the term “piece de resistance” or “resistance piece” implied that the fashions were in a way patriotic, and in protest to the Nazi occupation (a very different outlook than that taken during the First World War). 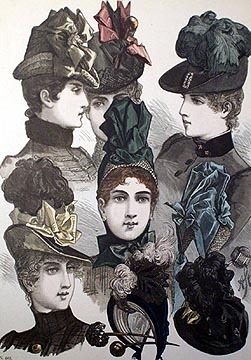 “Doll Hats”, similar to some styles seen in gothic fashion today, were also worn. They sat a-top the wearer’s head, very small and very far forward on the brow, reminiscent of some Victorian styles. The turban was another look, one that covered all or most of the woman’s hair, and that was pulled up into a ‘v’ at the front of the brow; sometimes coined “v for victory”, once again connecting fashion with patriotism. Post WWII saw a decline in the popularity of hats as many women chose to now leave the house without them. In an effort to keep afloat, the millinery industry began to create variety and extravagance, making hats the “must have” piece to top-off a formal outfit. While most hats remained close to the head, “pancake” and “cart-wheel” hats, wide-brimmed, flat pieces that perched atop short hairstyles were also popular. The 1960s saw a greater decline in the wearing of hats, although the popularity of Jackie Kennedy made the pillbox hat extremely fashionable for some time. The decade’s higher, fuller hairstyles meant that hats needed to be small and sit on the top of the head. Fashion in the 60s was increasingly geared toward youth, and so hats began to be viewed as a thing of the past. Towards the end of the decade, hats as a daily accessory, except during the cold months, were nearly extinct. Brief re-emergence’s have been seen since then, but for the most part, the hat as an everyday accessory died out in the 1960s.